I love having 5 kids. I do. But its quite challenging having such a range of ages in our house. There are so many activities that are for young kids or older kids, but not both. We have been doing the baby thing for 9 years in a row. My oldest is about to turn 9 years old and my youngest is 15 months, the kids are all 18-27 months apart. If you do the math you will realize that for the last 10 years I have been pregnant, nursing, had a newborn, and a child in diapers. That's a lot of diapers and sleepless nights. Quite frankly I am tired of all the babyhood. Whenever I have just the older 3 kids, its like heaven. Three children who can read, entertain themselves, fetch snacks, toilet, and bathe themselves. Heaven. But every once in a while I catch a glimpse of how great it is that we have another baby in the house (beyond the obviousness of having another sibling). I love how the older kids are watching Eleanor grow up. I love how they see how they were when they were little. I love how they see I give tons of care and love to Eleanor, because they know I gave the same care to them. They see the love come full circle, even if they don't remember the nights I spent rocking them or the screaming tantrums. They see how I teach her with love and how she is starting to be treated like a big kid and I am enforcing the rules. In addition they are learning to protect their sister, to share, to be part of a team. I am just a tiny bit sad that Eleanor won't get to be a big sister. But not so sad that I want to sign up for another few years of babyhood. I said Yes. I have a hard time with Yes. With the different sleep/nap/pick up/homework schedules its so much easier to keep half of the kids quiet with a movie or video games while I am trying to help or nap the other child/ren. Today is no different. Eleanor has been cranky and sleep deprived for a good 2 weeks. First it was a cold, then teething, now I think she is trying to transition to a once-a-day nap, but honestly I am not sure what is up with her. She decided to take an early nap. The little boys were playing outside, but then were naughty and had to play inside as punishment. They decided to launch cars and airplanes off the bed and see how far they would go. Yup, metal cars (hot wheels) and metal planes onto my bare wood floors. Did I mention that my room shares a wall with the boys room? I said Yes. It was hard. I helped gather pillows and place them all over the floor. The kids are half naked sitting together on William's bed experimenting with metal cars and flight. They have been mostly quiet. Mostly. I really need to endeavor to say Yes more often. After all, this Yes-play is education for them. Its fun. But its also education. Occasionally I get a phone call from the school, "Hi, I am calling from your child's school" My heart drops. I hold my breath. I wait. In those 30-seconds my brain runs a million scenarios. I start trying to remember if I heard sirens scream by my house. Where did I put my shoes so I can run out the door. The secretary always ends with "can you send in that yellow form?" or "your child scraped his knee". Every mother I know has that same fear when the phone rings and its your child's school. I think today's events are a reminder as to why that worries us so much. It started on Facebook, people were posting rumors of a students death at CVHS. Then, also on Facebook, the news reports came in; Glendale News Press and LAist. They all confirmed that a student had died at CV today. But all I could think about are the people who would be getting "that" call from the school. I wanted to jump in my car, drive to the elementary school and scoop up my children. The incident happend at the high school, a 1/4 of a mile in the other direction of the elementary school. But it didn't matter. When you hear tragic news you want to collect your family and hunker down. Its the protection instinct in all of us. Soon after I got a phone recording from the principal of the elementary school. She was calling to inform us of the fatal fall at CVHS. I lost it. I burst into tears. I remembered the bomb threats when I was at school (always false alarms), the death of a student in 1991, all of my high school memories came flooding back. The fear those students must be feeling. On top of that my own fears as a parent, placing myself in the shoes of the parents who got *that* call today. So much sadness. Today I am thankful that the school has only called me in regards to minor issues. And I pray for peace and healing for the students at CVHS and the family of the boy who died. I'm sorry that they had to get *the call*. After the tearful yet educational end to the Marshmallow Game the first time I promised the children we would try again. So we did. This time the experiment was a little different. I only had the 2 little boys at home; William and Alexander. They were eating an afternoon snack and they both reminded me "our marshmallows!". They were excited to try again. We reviewed the rules of the game and I put out one big marshmallow for each child. Alexander and I talked specifically about not picking off bits of the marshmallow. William wanted to know if he could lick his. I puttered around the kitchen getting a meal together for Eleanor, keeping a watchful eye. When they asked if they could eat I told them "yes, but then you only get one". They told me they wanted to wait. They both sat at the table patiently and made up a game to play to pass the time. No one got down from the table. No one asked, "is it time yet?" I ended up leaving the room for a bit. Then the timer went off and I briefly forgot why the timer had been set. The children hadn't. They hollered and whoohooed. They were very proud of themselves for waiting. They said. "We did it. We waited. We get 2!" They were very very proud of themselves. Alexander said, "I did it mommy!" multiple times. I was really excited to see that they are getting it and understanding about delayed gratification. I have come across this nifty study called the Marshmallow Experiment. Funnily, I have found it a few times via a few different routes. To summarize, a proctor leaves a child in a room with a marshmallow. The child is told that if s/he doesn't eat the marshmallow until the proctor is back then the child will receive 2 marshmallows to eat. However, the child can choose to eat just the one immediately. Only 30% of the children were able to delay gratification. Age was a correlating factor. However, many years later it was discovered that those same 30% who were able to delay gratification had become very successful in life and even have higher SAT scores. Its such a simple and easy study. Almost no materials are needed. The core of the study is that children who were able to delay gratification had a variety of other tools to distract themselves, keep busy or stay focused on the ultimate prize of two marshmallows. This same phenomena occurs through out life; stay in and study rather than going out on a Friday night. At work you keep your focus on long-term goals rather than short term fun. Even in your personal life one would interact with people focusing on a long-term relationship rather than hurting or upsetting someone in the short term. Therefore I have decided to Marshmallow-train my children. I absolutely want to teach them these skills. You are saying that there are lots of other ways to teach these attributes. I agree, but none are as yummy as marshmallows. Today was our first experiment. The children were writing their Valentines. I explained the situation. I placed a marshmallow in front of William (5), Connor (7), Alexander (3), and Lainy Ann (nearly 9). Eleanor toddled over, hand stretched out, and asked for her marshmallow too. I gave her one. I set the timer and promptly forgot about it as I puttered about the house, putting Eleanor down for a nap, etc. I walked into the kitchen and noticed little Alexander was picking off bits of marshmallow from the bottom. He was being sneaky about it! He lied to me WITH MARSHMALLOW IN HIS MOUTH and said, "no, me no eating it". Yeah, right, buddy. HaHa! The timer beeped and I doled out the marshmallows. William had resisted. Connor has resisted. Lainy Ann resisted. Alexander nibbled the entire bottom of his marshmallow. I did not get mad. I told him it was fine. He could finish that one but he would not get two marshmallows. Crocodile Tears. Wails. He was so mad and so upset with himself. He kept crying "but it is so hard [to wait]". I started to feel like a bad mom for playing this game. But after a bit of consoling he understood. He is looking forward to playing tomorrow. When I emerged from the bedroom Lainy Ann was in tears. She had lost her marshmallow! TEARS! She had earned two marshmallows, ate one and promptly lost the 2nd. WAILS, "I worked so hard waiting for it. I can't believe its gone." I shouldn't laugh, but its funny. I wonder what tomorrow's game will bring. I am still trying to decide if I should make them sit quietly with the marshmallow . . . . . hmmmm . . .
Its the simple things in life for the very young children. William (5) likes to race. Everything. He races the car, the shopping cart, me, and I don't even know it. Alexander (3) has a new box of orange and green toothpicks. He counted out all 125 of them and got to the number 10. He has thanked me for them multiple times already. Both of them loved dragging their fingers along the moving grocery belt, feeling the drag. All I could think about were the germs and the dirt. And now they are both outside breaking up boxes from todays delivery and jumping on bubble wrap. Its hard to remember how fascinating the world was when we were little. I am just glad I have my children to help me remember. I have known no other city in my life, well, at least not long term. I was born down the hill at Verdugo Hills Hospital. Yes, technically, it is Glendale. But it is part of our little valley that encompasses La Crescenta, Montrose, Sparr Heights and La Canada. I moved south when I was a young child, still technically north Glendale since it was above Glendale Community College and then back to this valley in middle school. I have memories of attending Rosemont Junior High and both of my parents tell me of their days at Rosemont as well. I remember going to Rocky Cola on a Friday night after a CVHS football game. Ten of us would order two baskets of french fries and water. We only tipped with whatever money was left over. Those poor waitresses. I grew up, went to college, got married and had a baby and realized I needed to be back in La Crescenta. I needed my children to grow up in this idillic valley. I'm sure a lot of my memories of the LC are throw the rose-colored glasses of childhood. But now that we are back I am finding that those rose-colored glasses come in adult sizes. I love the history that this valley has for us, for me and for our family. I love driving passed the rock covered church on Rosemont and know that my grandmother worshipped there for many years before going to heaven. I love driving passed CVHS and picking out the new buildings and the old buildings. Its fun seeing the cheerleaders and football players in uniform on Fridays, getting ready for the big game. I love visiting Dunsmore Park and seeing the wading pool I used to visit as a toddler. Driving by Clark reminds me of the stories my mother would tell me about how middle school used to be 7th - 9th grade. Every parent is concerned about safety when searching for a town to raise their family in and I am no exception. I live just a few blocks from Brigg's Sherriff station. They can (and have) been at my house in minutes; once it was because of fireworks being set off in our street, another time a drunk driver was speeding down the road. But they are also concerned with smaller safety issues as well. I have seen them stop teenagers wandering the streets after 10 pm, just checking and making sure no one is getting into trouble. Once they saved me from getting into trouble too - I arrived home with 3 young children and my door was standing open. Four patrol cars came to my house, swept the house and "cleared" it. In the end I realized my daughter hadn't latched the door all the way and the wind had blown it open. I was extremely embarrassed but very grateful. It was nice to be saved and know that my home was safe for me to enter with 3 small children. The bonus was the kids got to see the officers in uniform. As an adult I am falling in love with the LC all over again. We have such wonderfully historical places to visit; the Lanterman House, Descanso Gardens, CVWD, and the Adobe House off of Verdugo. Of course all these visits were just a mom chaperoning children on a field trip, but I think I enjoyed them far more than the children. I learned about how water was brought to the valley, how inexpensive land was 'way-back-when', ancient trees, what happened when the freeway came through, and many more historical gems. I can't imagine ever leaving this valley, this balcony to Los Angeles. When I do visit other cities I am always anxious to get back; not just for the great weather, but the sense of community, the safety, the history. Dear La Crescenta, I love you. I can't imagine raising my children anywhere but here. I can't believe I never blogged this story. This happened in the fall, it was a cool day and Alexander was just over a year old. It had been a long day, but most days were when you had 4 young children under 6 years old. I pulled into the driveway looking forward to dinner, bath and bedtime. I realized though, that the front door looked funny. The shadows were wrong. The door was ajar. I thought about what to do. I decided to peak inside. I thought about leaving my cell phone in the car with my children "just in case" but what kind of instructions do you give to a 5 year old about calling 911 if something bad happens. What does that even mean to a 5 year old? I approached the door slowly worried about what was inside. I pushed the door open with my foot, you know, so the bad guys wouldn't get me (I guess someone watches too much tv). The house was a disaster! Toys everywhere, cabinets standing open, clothes on the floor. Horrible. I went back to the car and called the Sheriff's department and explained the situation. I told her, "I don't remember locking the door and to be perfectly honest my house is normally pretty messy". They decided safe was better than sorry and said they would send someone over. Imagine my surprise when 3 black and whites showed up and an undercover car. They had me go down the street out of the way. I told them once again that I don't recall locking the door and I have 3 preschoolers so things tend to be messy under normal circumstances. The police officers (men and women) drew their guns and headed into the house. I started thinking of scenarios where burglars would jump out of windows and bullets would fly and I made sure the kids were in the car, safe. I could hear them talking on the walkey-talkies, "clear, clear, clear . . . "
The senior officer came to talk to me. He assured me they had looked in every room and every closet, but the 3 laptops on the desk and 2 watches on the counter were pretty solid proof that no one had been in the home. It all came back to me then. I had let my oldest daughter walk out of the house last and close the door behind her. I had not locked the door and she must not have closed it all the way. I was pretty embarrassed and apologized profusely to the officers. They were kind and told me again it was best to check rather than send me into a home alone with my young children. They talked with my kids a little bit and showed them the cars. And that's how my children got their own private audience with the Briggs Sheriff's department. There are many trophies in my house. Many of them are from soccer, not tournaments or wins, but trophies given to children for merely showing up to games. They don't even need to participate. In fact, one could argue they are my trophies since I paid for the season and schlepped kids too and fro. These trophies collect dust, fall, are under the bed or used at swords. But a few weeks ago 2 medals made their way into "mommy's special cabinet" along with a pinewood derby car. 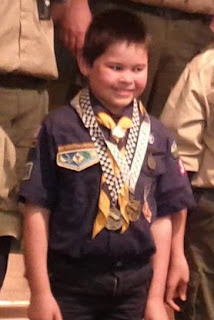 Connor, a wolf (2nd year of cub scouts and only 7 years old), won first place in his den. Then he raced against the whole pack (approximately 70 other kids) and won 2nd place. Can you believe it? These 2 medals are the first trophies that have been truly earned in our house. Connor chose the design for his car all by himself, he sanded and painted his car. Daddy helped glue in the weights and lube the wheels (due to dexterity and the messiness factor). I am so incredibly proud of him. And as you can tell from the picture, he was pretty proud of himself.